Star Wars: The Force Awakens will not mention Midi-Chlorians! In the words of C3PO, "Thank the Maker!" If you do not remember, as implied by Qui-Gon Jinn in the clip below, Midi-chlorians were said to be microscopic life forms that allow the use of the Force. 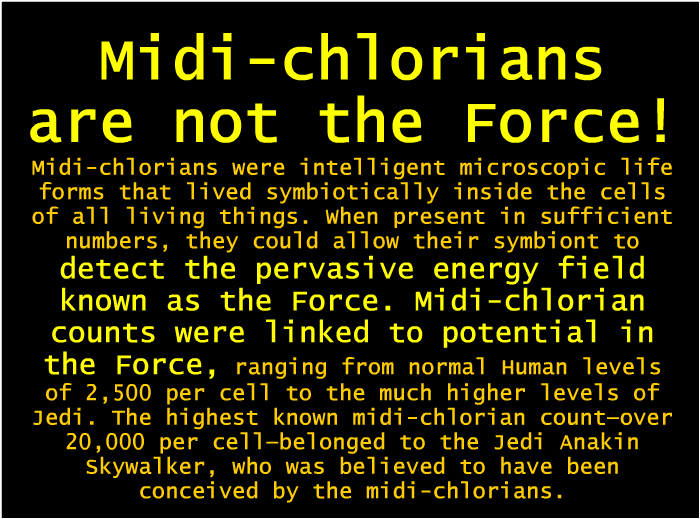 However, in the later Expanded Universe books, Midi-chlorians are explained to reside more strongly in those with a strong connection to the Force, although that can also be inferred by what Quin-Gon said in Episode 1. Midi-chlorians not being mentioned in The Force Awakens makes sense canonically because they were never mentioned in the Original Trilogy. They have absolutely no relevant to the story. Even in the Phantom Menace, Midi-chlorians serve little to no purpose, and they are not even mentioned in the other prequel films, so ultimately, not mentioning them is not a big deal even if you like the concept. What do you think of this news? Please comment below and let me know!